This little champ arrived today, straight from an army surplus shop in the UK. My plan is to travel as cheap as possible, so in Europe I’ll be staying at campsites and once I’m in cheapest areas, I’ll use hostels from time to time or just camp out in the countryside. 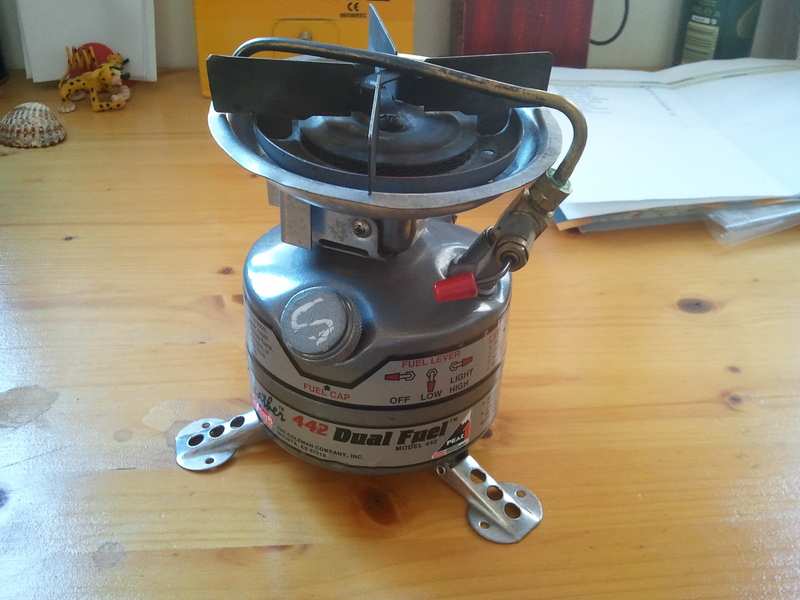 I’ll be doing some outdoor cooking, so I wanted to find a stove that could burn fuel from the bike, as I imagine it is not possible to find gas canisters outside Europe and I don’t want to be carrying the extra weight and space of fuel canisters or a dedicated fuel bottle. With that in mind, I checked what options I had. The Optimus Nova looked great – lightweight and compact, but it was too expensive, I have to seriously try and keep things within budget. The MSR WhisperLite was another option, but again, same drawbacks – too expensive, and I didn’t like the hassle of having a separate fuel bottle that I’d have to attach ever time I wanted to cook. So in the end I settled for Coleman. They have a solid reputation for durability and reliability – the army uses them and some people have had their stove for decades, and they have a model with a built-in fuel canister and pump. Reviews were really good, and I liked the compactness and apparent ease of use, so I settled for this one. Mind you, it was still quite an expensive purchase, so I went off in search of a good bargain and finally found this one (used) from an army surplus store. It looks great, used but in good condition. I’ll test it as soon as I have a moment and report back. This entry was posted in Equipment, Stroming The World 2013 and tagged camping, Coleman, cooking, stove by Kilian. Bookmark the permalink.